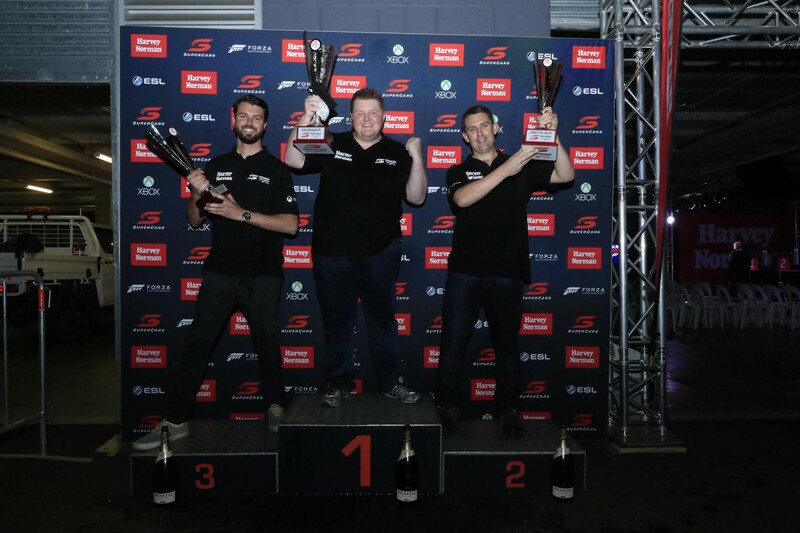 Victorian Jacob Harvey has won the inaugural Harvey Norman Supercars Forza Challenge, prevailing in a thrilling battle with John Burrows in the Grand Final at Mount Panorama. Eight online racers headed to the 2017 Supercheap Auto Bathurst 1000 following a qualification process, and lined up with Supercars drivers in an All Stars race in the pits on Thursday evening. A series of heat races followed, setting the grid for a 20-lap showdown around Mount Panorama. Harvey - the fastest driver in pre-event qualifying - started on the front row and took an early lead, passing polesitter Andrew Dyson around the outside at the Cutting on the first lap. Dyson then fell all the way back to sixth when he skated through the McPhillamy Park gravel trap on lap two. Burrows, who had qualified fourth after an up-and-down run through the heat races, overtook Jarrod Lamprey for second and then started pursuing Harvey, and by lap six the two leaders were nose-to-tail. The compulsory pitstop window opened on lap 8 and having been unsuccessful finding a way past Harvey, Burrows pitted on lap 11 while Harvey waited until the very end of the pit window on lap 12 before stopping. Harvey rejoined just in front, only to run wide at Griffin’s Bend, allowing Burrows into the lead. But Harvey redeemed himself with a brilliant move around the outside through the Cutting on lap 16, and a lap later Burrows spun at Griffins Bend, allowing Harvey to cruise to victory. “It’s just been an amazing week, surreal to race here at Bathurst and have the chance to team up with a Supercar driver on Wednesday night, and this just caps it off,” Harvey said. “Early in the race, I could see John reeling me in and I thought he was going to get me on the pitstop but I managed to hang onto it. “I threw it away at Turn 2 and thought he would pull away but I managed to keep the pressure on. “The pass on the outside through the Cutting was awesome and he raced really cleanly to allow us to race side-by-side. Despite the tough defeat, Burrows was thrilled with second place. “I got a bit bashed up in the heat races but I knew I had really good pace; I made a couple of critical moves early and was able to get up the front of the pack,” Burrows said. “I was having a good crack at first place but ultimately Jacob was way too good and he’s very deserving of the win. Dyson picked up the final podium place after a great recovery drive, in which he passed several of his rivals including Lamprey into the Chase. “I had to work hard for the third place but passing cars was really enjoyable,” Dyson said.